The growth of unstructured data, especially files, continues unabated and strains enterprise infrastructure. The problem isn't just storage of growing data, but backing it up, making it available with high performance for users in distributed offices and for mobile users - all while providing for disaster recovery. These challenges wreak havoc on staff and budgets. 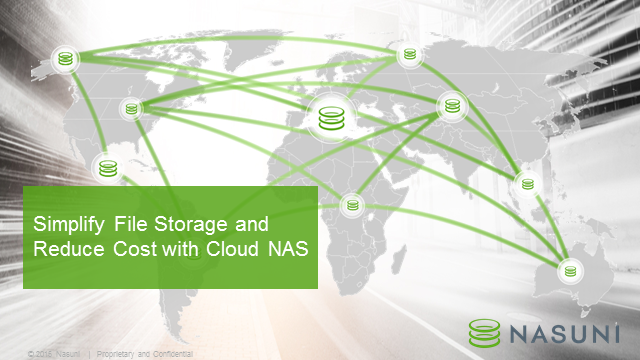 It’s time for a new approach to NAS that takes advantage of the cloud, while still providing local access, performance and security. Learn about this new generation of bottom-less, backup-less NAS that makes files accessible anywhere. Cloud NAS solves the challenges of file data storage, costs less to own and manage, and ends the cycle of NAS hardware refreshes forever.